Francesco Schettino, the 52-year-old captain of the cruise liner Costa Concordia, began his pretrial hearing last week in the small Tuscan city of Grosseto. 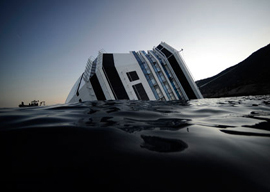 The Costa Concordia capsized on the evening of Friday January 13th after hitting barely submerged rocks close to the tiny island of Giglio 10 miles off the Tuscan coast. Thirty-two of the 4,229 passengers and crew onboard died. Captain Schettino is accused of manslaughter, causing the shipwreck, and abandoning ship. Once disaster struck, Captain Schettino did not send a Mayday message for 45 minutes. Then, in true Italian style, he abandoned ship while there were several hundred people still onboard. His crew, the Italians among them at least, shoved passengers out of their way in the scrabble for the lifeboats. He then blamed the disaster on everyone except himself and claimed that had it not been for his skill, thousands of lives would have been lost. In his hometown of Meta di Sorrento in the corrupt and Mafia-infested south, he enjoys the status of a wronged and wounded hero. The week before his first court hearing began in a theater because the courthouse in Grosseto is too small to accommodate the scrum of journalists and survivors, he even launched a lawsuit against his employers. He is”wait for it”claiming wrongful dismissal and back pay.